When you’re moving from London to Chester one thing you won’t be short of is advice. Tell people you’re moving home and immediately you’ll find everyone wants to share their own war stories. You must do this and whatever you do, don’t do that. Some of it will be very good advice of course, some of it, perhaps not so good. One piece of advice always worth hearing however is how important it is to choose a reliable and trustworthy removal company. Trying to move home without hiring a removals company is not even worth thinking about. Just the worry alone caused by the extra responsibility you place on your shoulders is not worth it. You may, possibly, save a few pounds off your budget but the stress will take a few years off your life. So the best advice is to hire an excellent removal firm and for that you need to phone Moving Service. We’re a removals firm you can trust completely and our prices are so low you will probably end up saving money in the long run. Why not ring us now on 020 8746 4402 and find out for yourself. For your home or office removal to Chester one other general piece of advice worth hearing is to always be flexible. Always be prepared for the unexpected. No matter how much you can organise and plan ahead for moving to Chester, there’s always going to be something which doesn’t work out as planned. By hiring our removals firm however, it can minimise, if not eliminate altogether, unwanted events happening when you’re relocating to Chester. 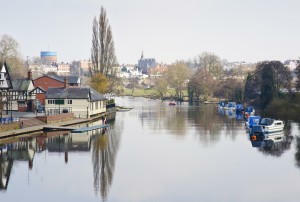 The City of Chester lies on the River Dee in the county of Cheshire close to Wales. Founded in AD79 by the Romans, you can walk the city walls which still stand today. It has a population of 118,000 and is a city with many attractions such as Chester Zoo. Opened in 1931, Chester Zoo is one of the largest zoos in the UK. Chester also has a racecourse which is very popular amongst horse racing enthusiasts. 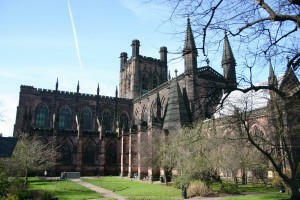 Chester Cathedral, which dates back to the 11th century, lies in the heart of Chester on St Werburgh Street. This picturesque city also has great shopping, dining and entertainment venues. We can help you move home to Chester in a number of ways. Even if it’s simply a man with a van you need you can rest assured our removals staff are highly trained to take the utmost care and make sure your belongings arrive in Chester in the same condition as when they left London. We’re not just there for you only on the actual removal day however. We assist you in the weeks building up to your removal day by offering a selection of removal services aimed at making you moving house or moving office to Chester the best experience it can be. For instance, we have storage space available for you. Secure, top of the range storage space at the cheapest prices. We have packing accessories available for you. All you could ever need, so when you do need an item quick, you know where to turn. It’s these little things which can not only save you time but save you money when you’re moving house or moving business to Chester. So why not call Moving Service now on 020 8746 4402 and receive your free quote. We’re the removal business that has the cheapest prices and the best removal services for your house move to Chester. Along with moving from London to Chester, hiring our removal firm will be the best move you ever made.